The new Lego House is taking shape - our childhood dreams made real! Lego fans of all ages will soon be able to step into the new 12,000 square metre 'House of Bricks' after its grand opening on 28th September. 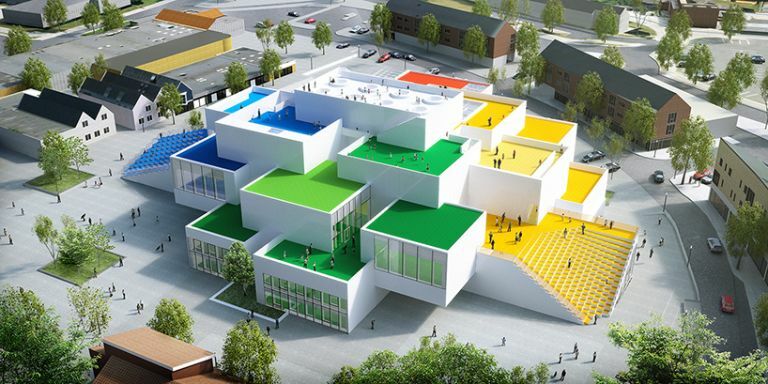 The idea behind the new Lego House in Lego's home town of Billund, Denmark is to encourage children of all ages to learn through the "hands on, minds on" experience and to spread their essential values: imagination, creativity, fun, learning, caring and quality. All the Lego Batman sets from the new Lego Batman movie! This may all seem pretty cheesy on the surface but once you get past the marketing lingo, the centre looks as though it will be a place of dreams (ours if not yours). The whole structure is designed to looks as if it is made from Lego bricks, and will contain a play area, a Lego museum, a store and a place for visitors to display their creations. A highlight of the building will be an area known as the 'Red Zone' - a place dedicated to creating stuff from bricks. There is a literal pool of Lego (complete with a fountain of the iconic, colourful bricks) which hold unlimited resources to build whatever you want, there will even be someone to help with your builds. Lego House will have a a mixture of both free and paid things to do. The Lego company hopes it will attract 250,000 visitors per year from across the globe. Available for free is a cafe, store and restaurant on the ground floor as well as access to the very top of the Lego house which will stand at 23 meters high meaning fantastic views over Billund though perhaps it won't be a great idea on a rainy day. Plus, if you've ever been to Billund you'll know that there isn't exactly a lot of high-rise action to see. If you're thinking that there's already a Legoland in Billund then, well, you'd be right about that. But when the Lego Group was experiencing leaner times it sold a majority stake in its parks to the Merlin Entertainment Group. The building - designed by Bjark Ingels Group (BIG) - is made up of 21 white blocks made to look like enlarged Lego bricks. Constructioin started in early 2014 and after having its original opening date pushed back from 2016 will open in September.